this time, the wolves will do her bidding. Stitched area is 10.2" w x 15.6" h with a stitch count of 163 x 249. Stitched 2 over 2. Like the lotus flowers behind her, with their blooms growing up from the darkness, Persephone emerges from the underworld once a year to return to her mother Demeter and herald the beginning of spring. 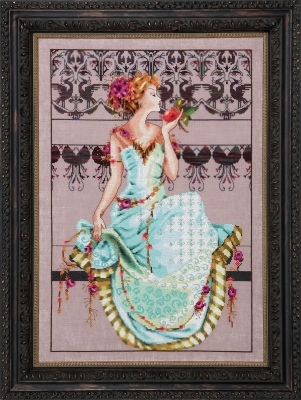 Surrounded by cranes, symbols of happiness, good fortune, and longevity, she embraces the beauty of the Victorian era in her aquamarine gown while she contemplates the luscious pomegranate and the coming harvest. 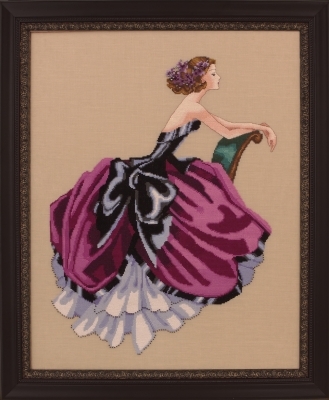 Stitched on 32 count Pink Sand Linen (65-280) by Wichelt Imports. Stitched area is 12.5" w x 18.75" h with a stitch count of 200 x 300. Stitched 2 over 2. These lovely Provence Roses are also known as Cabbage Roses. They have a strong sweet smell and a double bloom form. Their mnay petals add to their luscious volume. They are beautiful stitched on linen or scattering their petals in the wind through an English garden. 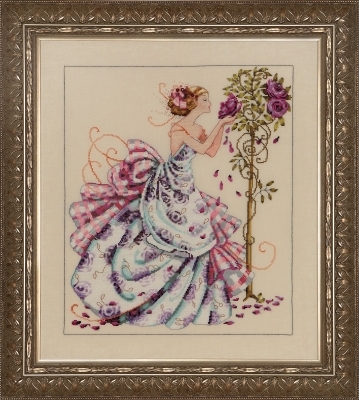 Stitched on 32 count White Chocolate Linen (65-94) by Wichelt Imports. Stitched area is 13.75" w x 16.25" h with a stitch count of 220 x 260. 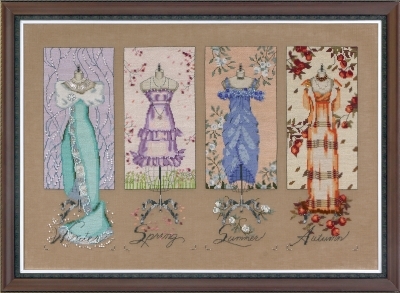 Stitched 2 over 2.
dreaming of roses and lilies. 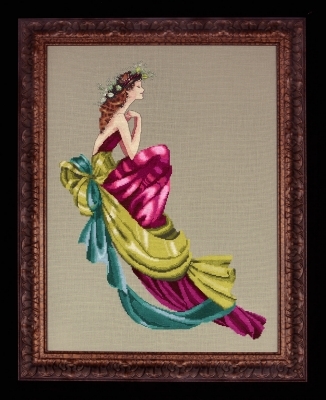 Stitched on 32 count Beach Walk Linen (65-282) by Wichelt Imports. Stitched area is 13.4" w x 19.6" h with a stitch count of 214 x 313. Stitched 2 over 2.
is surrounded by amethyst roses. The blue light of the moon shines on her sweetly infused Earl Grey tea. 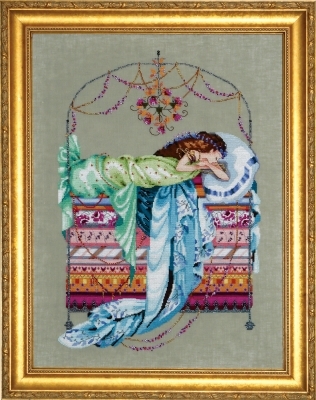 Stitched on 32 count Violet Mist Linen(65-292) by Wichelt Imports. Stitched area is 8.13" w x 8.13" h with a stitch count of 130 x 130. Stitched 2 over 2. 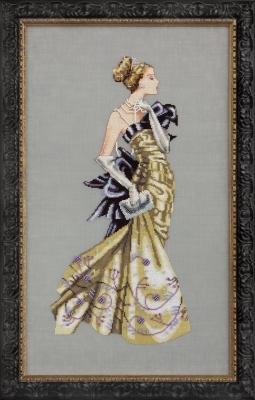 Stitched on 28 count Milk Chocolate Linen(76-95) by Wichelt Imports. This design is named for my favorite movie icon. beautiful way she lived her life. and truly lived. Please meet Elizabeth. 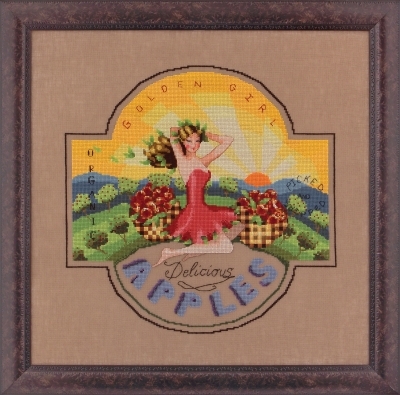 Stitched on 32 count Natural Light Linen (65-140) by Wichelt Imports. Stitched area is 13.25" w x 17.31" h with a stitch count of 212 x 277. Stitched 2 over 2. 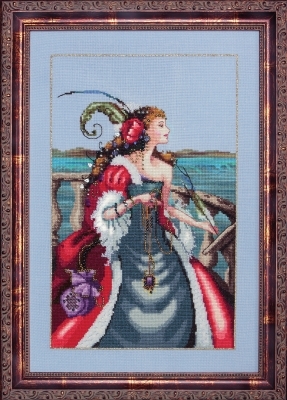 This treasure of cross stitch is a symphone of fuschia, teal and lime. The pose is one of elegance and quiet contemplation. 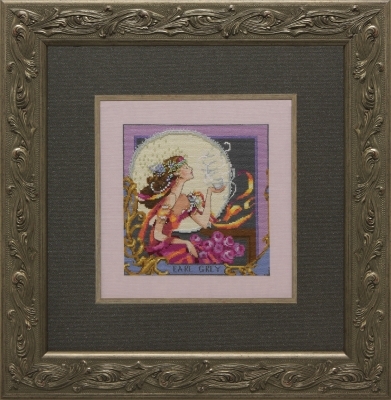 The simple flowing satin shows a subtle sheen and give this piece and Art Nouveau feel. Stitched on 32 count Beach Walk Linen by Wichelt Imports. 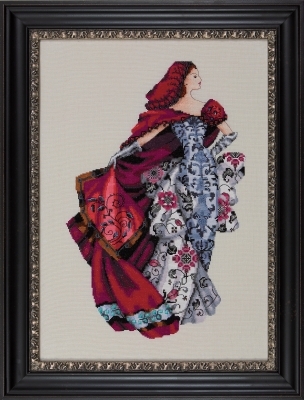 Stitched area is 11.94" by 15.88" with a stitch count of 191 x 254 Stitched 2 over 2. DMC floss used. Blends are one strand each. Exuberant double blossom peonies create a purple haze at twilight. With names like “Cup of shining night”, “Story Enchantress” and “Red embroidered needles ball”, it is no wonder that the peony tree is the center of every spring imperial garden. 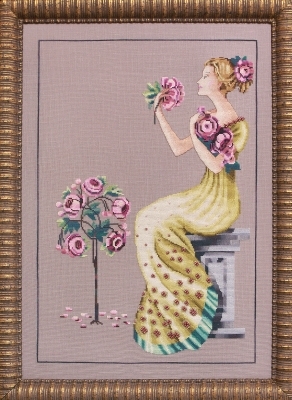 Stitched on 32 count Pink Sand Linen by Wichelt Imports. Stitched area is 11.88" by 18.13" with a stitch count of 190 x 290 Stitched 2 over 2. DMC floss used. Blends are one strand each.